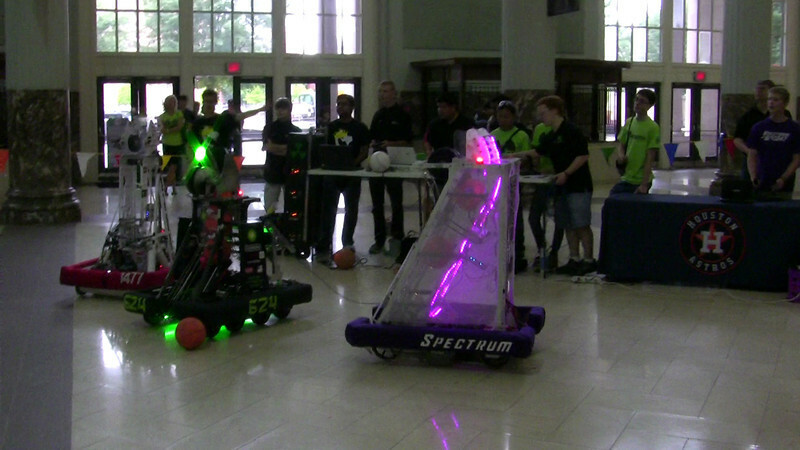 Students from Team 624 performed a robotics demonstration with many other FRC, FTC, and FLL teams from the greater Houston area on August 25, 2013. Many robots of all sizes were on display along "Conoco Alley" while FRC robots from the 2012 and 2013 seasons were shooting discs in Union Station and basketballs outside near the Plaza. Astros fans were treated to a variety of different robots and the young fans especially enjoyed the interaction with the teams. Our students did an outstanding job of answering questions from fans and providing some unique entertainment for all those entering the park.